You probably remember one of the best comebacks in NBA history. After winning three consecutive NBA championship titles, Michael Jordan retired to pursue something else, baseball. The greatest basketball player to wear the number 23 on the court was gone. The Chicago Bulls were still playoff bound, but not quite the same without him. Just when we were getting used to the Bulls without Air Jordan, we see him making a return to the game, but this time wearing #45, representing a new beginning, new era, and new titles to be won (another 3 consecutive). 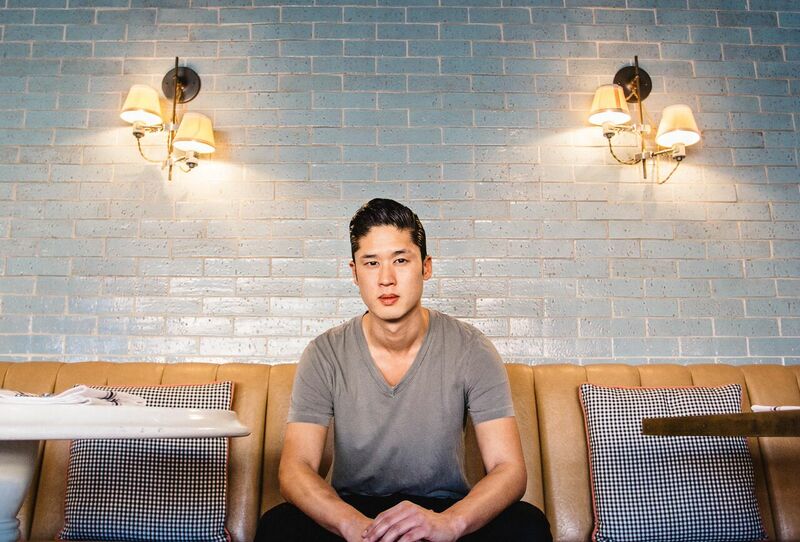 Kris Tominaga started The Hart and The Hunter with chef Brian Dunsmoor over 3 years ago. They left in 2014 to pursue other projects. While the menu kept Kris Tominaga's famous biscuits, other well known items were gone, like the savory and bacon-like chicken cracklins. Tominaga was no longer there and that modern Southern cooking done with a California finesse, was different at the Hart and The Hunter. That is until last month. He's back. Wearing # 45, so to speak, Kris Tominaga is back in full force. With him he brings a fresh new take on the menu at the Hart and the Hunter, but stays true to the original feel and concept. The revised dinner menu offers chicken cracklins with hot pepper vinegar, served with either chopped shrimp or smoked chicken salad. It's a starter you need to order, along with those flaky, buttery, and airy biscuits that fall apart in layers as you garnish them with house-made jam, maple butter, or pimento cheese. The biscuits are better than ever. The chopped scallops with hominy, bacon and lime is a comforting and complex dish of flavors - acidic with lime, balanced by hominy, and smokey with the addition of bacon. But the standout dish on the new menu is the grilled pork collar with escargot brown butter - so tender, flavorful, yet delicate. If pork collar sounds a bit odd to you, consider it the butcher's prized cut. It's special, one-of-a-kind, and not to be mistaken for an everyday pork chop. You will be more than happy that you ordered it. Tominaga will be stepping in as the Group Executive Chef over all Paligroup properties so you can expect changes at Palihouse as well. The brunch menu will soon be revamped, as if the Hart and the Hunter wasn't already a hot spot on weekend mornings, you'll definitely want to be brunching there soon. Chopped scallops, hominy, bacon, and lime. Banana cream pie with graham cracker crust and meringue.